During the 9th century, Vikings established a trade port in Dublin in western Ireland. They controlled this area of Ireland for much of the next 300 years. Danish Vikings invaded and settled northern and eastern England beginning in 876, and managed to control a third of Britain (the Danelaw) for nearly 80 years. The Danish prince, Cnut the Creat, was king of England from 1016 to 1035. He also ruled Denmark and parts of Norway and Sweden. From 793 A.D. until 1066 the Vikings explored, settled, plundered and traded with much of Europe, Africa’s Mediterranean coast, Iceland, Greenland, and the northern part of North America (Vinland). They set up trading posts along the Volga River, and are known to have engaged in trade as far away as Baghdad. They established settlements as far south as the Black Sea and served as mercenaries in Byzantium. Not all Vikings were transient raiders, pillaging and moving on. They founded many permanent settlements and colonies, laying the groundwork for new cultures and major historical events. By 859 A.D., Swedish Vikings, called Rus’, had settled in eastern Europe along the Volga River for trade purposes. Legend has it that one of the Rus’, Prince Rurik, was elected ruler of the local Slavic population. Over time, the Vikings were assimilated into the Slavic culture and expanded their domain from their capital in Kiev. Their nation came to be known as Kievan Rus’, from which modern-day Russia draws its name. In 851, a group of Vikings began settling on the coast of northern France. In 911, the French king granted them control of their own territory on the condition that they help protect France from additional Viking raids. The region became known as Normandy, named for the Viking “North Men” who lived there. William the Conqueror, a descendant of those settlers, asserted control over all of Normandy by 1050. He became the first Norman king of England after crossing the English Channel and defeating Harold Godwinson at the Battle of Hastings in 1066. During the 9th century, Vikings established a trade port at Dublin in western Ireland. They controlled this area of Ireland for much of the next 300 years. Danish Vikings invaded and settled northern and eastern England beginning in 876, and managed to control a third of Britain (the Danelaw) for nearly 80 years. The Danish prince, Cnut the Great, was king of England from 1016 to 1035. He also ruled Denmark and parts of Norway and Sweden. Scandinavia is perched atop northern Europe, its natives referred to throughout history as “North Men.” Separated from the main European continent by the Baltic Sea, the Scandinavians have historically been renowned seafarers. Their adventures brought them into contact with much of the rest of Europe, sometimes as feared raiders and other times as well-traveled merchants and tradesmen. The Goths, originally from southern Sweden, wandered south around the 1st century B.C., crossed the Baltic Sea, and settled in what is now eastern Germany and Poland. In 410 A.D., forced west by the invading Huns, the Goths sacked Rome, contributing to the decline and fall of the Western Roman Empire. The Greater Caucasus Range, running northwest to southeast between the Black and Caspian Seas, is the traditional line of demarcation between the continents of Europe and Asia. It was here, according to Greek mythology, that Zeus bound Prometheus for giving fire to humans. Linguistically, culturally, and even ecologically diverse, the Caucasus area is home to more than 50 ethnic groups and is one of 34 "biodiversity hotspots" (areas with significant, threatened biodiversity) in the world. Walter Buntjer (RENA J. BUSS, JOHN) was born 24 July 1910 in Brookville, Ogle, Illinois, USA, and died 22 Jul 1974 in Polo, Ogle, Illinois, USA. 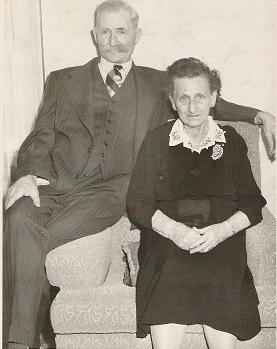 He married Edna Bertha Peterson on 23 July 1931 in Ebeneezer Church; Pearl City, Stephenson, Illinois, USA, daughter of MARTIN PETERSON and ANNA GAST. She was born 15 Aug 1906 in near Pearl City, Stephenson, Illinois, USA, and died 27 Nov 1953 in Polo, Ogle, Illinois, USA. He married ROSA V. FELDKERCHNER 19 Dec 1955 in Wisconsin, USA, daughter of FRANK FELDKERCHNER and MARY MCMILLAN. She was born 21 Sep 1910 in Rice Lake, Barron, Wisconsin, USA, and died 22 Nov 1995 in Oregon, Ogle, Illinois, USA. Charles Walter Buntjer was born on the farm near Brookville, Ogle County, Illinois, USA. He has lived in San Francisco since 1963! Yvonne Carol Buntjer was born in Cherry Grove Township, Carroll, Illinois, USA. 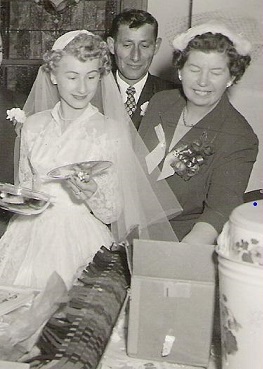 She married Kenneth Burt on 29 Nov 1952. She currently lives in Tucson Arizona. Mrs. Edna Born: Buntjer, 46, of Polo Route 2, died at 3 a.m. in 1953 following an illness of five months. She was born on a farm near Pearl City on Aug 15, 1906, a daughter of Martin and Anna (Gast) Peterson. She was married to Walter Buntjer at Pearl City on July 23, 1931. Mrs. Buntjer had been a member of the Ogle County Home Bureau. Surviving are her husband; her parents who live near Pearl City; a son, Charles, at home; a daughter, Mrs. Yvonne Burt, Rockford; a brother, John Peterson, Pearl City; and three sisters, Mrs. Louis Blum, Freeport, Mrs. James Engal, St. Louis, Mo., and Mrs. William Garrett, Mexico, Mo. Funeral service will be held at 2 p.m. Sunday in the Brookville Evangelical Church with the C. J. Krell, pastor, officiating. Burial will be in Fairmount Cemetery. Friends may call at the Melvin Funeral Home until noon on Sunday. Mr. John J. Buntjer , was born in Germany on October 2, 1879 and passed away in Freeport Illinois on December 15, 1962. Burial: White Oak Cemetery, Forreston, Ogle, Illinois, USA Social Security Number: Bet. 1956 - 1957, S. S. #: 346-32-0759; issued in Illinois. He and his wife Rena farmed in the Forreston area until they moved to a home in Forreston Illinois. Mrs. John (Rena) Buntjer of Forreston died Wednesday night, 08 Aug 1962 in Freeport, Stephenson, Illinois where she was admitted August 3rd to the Freeport Hospital. Rena J Buss (John was born Dec. 3, 1876, near Forreston, daughter of John and Fannie Buss. 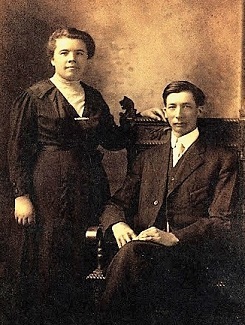 She married John J. Buntjer, Sr. on 10 Jan 1901 in Forreston Grove Church, Forreston, Ogle, Illinois, USA, son of John Buntjer and Elizabeth Janssen.